Time travel has always worked like magic—it has always required a leap of faith and science to make the incredible seem possible in science fiction and fantasy. 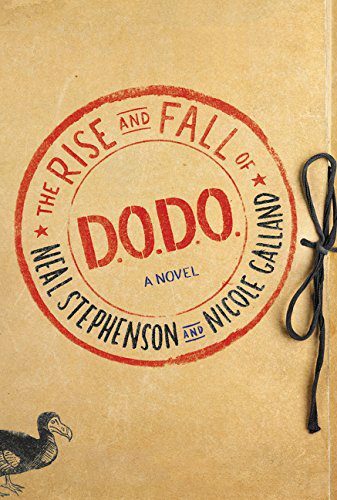 Neal Stephenson and Nicole Galland’s latest collaboration The Rise and Fall of D.O.D.O., is a time-travel novel without the grim philosophical overtones of classic time-travel tales. Galland is a writer of historical fiction, and her expertise in the genre is supplemented by Stephenson’s dry humour and plausible science. The book manages to do a fantastic job of converting non-believers into believers—in both magic (or witchcraft) and the “science” of time travel. The Department of Diachronic Operations (D.O.D.O.) is a shadowy military arm of the government tasked with investigating the cause of the gradual decline of magic in the world, and whether it’s possible to revive it. The depletion and restoration of magic has been a theme central to many a work of fantasy, including Zen Cho’s Sorcerer to the Crown (2015) and Susanna Clarke’s Jonathan Strange & Mr Norell (2004). While both Cho and Clarke set their novels in or around the Regency era in England, D.O.D.O. is a global enterprise headquartered in present-day America, with time-travel operations expanding across multiple strands of the temporal continuum, and, in physical space, across continents. A deeply intertextual text, D.O.D.O. is therefore able to combine different narrative threads from the history of the West to create a delightful series of adventures. It is a book peppered with private journal entries, letters, official transcripts, memos, and presentations. In the age of Wikileaks, these epistolary sources give readers the impression of reading hacked cables or leaked emails. The novel’s real strength lies in its speculation, multiple viewpoints, historical research, and a diverse ensemble of characters and settings, and this certainly makes D.O.D.O. a fascinating read. The novel manages to combine disparate elements in unique ways. It opens, for example,with Major Tristan Lyons rescuing Dr. Melisande Stokes from an uneventful life in a teaching position at Harvard, and recruiting her to translate a trove of artefacts pertaining to magic. Soon they discover that the decline of magic over recent centuries has coincided with the rise of science and technology, especially photography. It turns out that witches, who performed magic, could previously access multiple strands of time, or parallel universes, and “summon” what they needed from these alternate universes. Photography, however, froze reality in one moment or strand, making it impossible for the magicians to access all possible realities or probability waves. [In 1851,] all of the world’s technologies were brought together for the Great Exhibition at the newly constructed, magnificent Crystal Palace in Hyde Park, London. […] This conscious concentration of technological advancement all in one point of space-time, had dampened magic to the point where it fizzled out for good. Like a doused fire, it had no power to re-kindle itself once extinguished. With the help of Dr. Frank Oda and his wife Rebecca (a descendant of one of the witches burned in the Salem witch trials), D.O.D.O. builds an industrial-scale version of the box used in the Schrodinger’s Cat experiment, a supercooled quantum chamber where multiple probability wave-functions can coexist, thus making magic—or alternate realities—possible. D.O.D.O. takes advantage of a stern but gullible witch preserved by magic, Erszebet Kaparthy, who still desperately wants to perform magic, and uses her knowledge to mostly undertake diachronic operations (or time travel). In this circuitous way, the group intends to make critical interventions in history which will ensure the prominence of the USA in the modern day. D.O.D.O. also builds a network of witches in earlier periods to travel across time and geographies, and these diachronic operations lead to unintended, tiresome, and disastrous consequences. For the first half of the novel, D.O.D.O. is controlled by men; however, it is the women who hold real power and magic, in the form of their knowledge and skills. The three female protagonists Melisande, Erszebet, and Rebecca, feel extremely comfortable in their skins and opinions, and it always seems highly unlikely that they will give in to patriarchy or the military machine that enforces it so easily. The witches’ powers (or knowledge) pass from mother to daughter—perhaps in the form of recipes and stories—the witches themselves appear to be smart, intelligent and empathetic women who want to help people and work to achieve various freedoms (including the rights to vote, voice their opinions, and practice science). In contrast, the male characters seem caricatures intended to provoke laughter; D.O.D.O. is also in part a satire on how ridiculous and dangerous things can get when organizations become too large, too bureaucratic, and too male-dominated. Indeed, D.O.D.O. transforms within five years from a bootstrapped-and-lean startup to a giant organization—at which point the original founders no longer seem relevant or willing to work. The rise of D.O.D.O., and its militarization, doesn’t however translate into power or freedom for the witches: the women who performed magic in the old world (although stealthily, in order to avoid persecution) now need the government’s funding and permission to practice their craft in the new. Once again, the witches end up becoming mere instruments—this time in the hands of the D.O.D.O war machine. This is, however, as far as the novel goes. In Zen Cho’s Sorcerer to the Crown, the female body is considered too frail and weak for the exhausting profession of a royal magician; women are grudgingly allowed—even expected—to perform magic only to fulfil their domestic chores and duties. Likewise, in the novel by Susannah Clarke, two Englishmen—Jonathan Strange and Mr Norell—are bestowed with the great responsibility of rescuing and championing real, practical magic over the theoretical kind. On the other hand, whilst it, too, deals with the decline of magic and the attempts to restore it to its former glory, D.O.D.O. doesn’t concern itself with the exploration of gender politics, or the politics of Fairyland. There are no magical creatures to be found in D.O.D.O., and its seemingly scientific premise echoes the incredible world of Marvel comics, or books of science fantasy—for example, Charlie Jane Anders’s YA novel All Birds In the Sky (2016). In All Birds In the Sky, the in/compatibility of science or technology and magic is explored through deeply touching and disturbing stories; in D.O.D.O. we are instead treated to an action-packed epic ride. Like many fantasy books these days, D.O.D.O. bears a great potential for being serialized for television: it is replete with adventures, epic battles, and prolonged tensions between the characters, all ingredients for a good TV drama. Vivid, and slightly over-plotted, as a novel it is, however, a bit too predictable, and at times almost reads like detailed instructions for a team of video game designers. The time-travel motif perhaps means that D.O.D.O. is understandably densely packed with adventures set during actual historical events. The Elizabethan period drama with Kit Marlowe is beautifully rendered, and the adventure set in pre-Fourth Crusade Constantinople deserves a book of its own. After a while though, these set pieces become too many, and distract from any deeper exploration of the novel’s themes, settings or implications. As the novel wears on, the countless schemes and quests for power no longer seem intriguing. The repetitive and predictable assignments take us so often into other eras and worlds of the past that it becomes difficult to catch up with the main plot, or to parse how each episode might impact the present day. That said, the authors maintain a witty, light tone throughout the novel, and the chemistry between Lyons and Stokes is compelling enough to keep readers hooked till the end. It just might have been nice had all that activity led somewhere. From the fourth paragraph: "In this way, Gaiman and Galland place into tension", really? I mean, Neil is profilic but is he ghost writing Stephensons work as well these days?